Over a month ago, in anticipation of my return to the College, I asked Clint (as keeper and facilitator of the Village Gathering) to set aside this first gathering of 2017 for an opportunity to speak with the entire Pearson Community. This is a new year and an opportunity to renew our College’s commitment to the UWC mission and to reflect on our plans and priorities going forward. This will be the focus of the first part of my presentation after which I hope to engage in a lively discussion with all of you. I have another purpose in speaking to all of you today – and that is to tell you about my family, our decision to come to Pearson College and our journey to get to this place. First, let me tell you how very happy I am to be back at Pearson and settling in with my husband, Chris, and our boys, Jack (age 11) and Michael (age 6). I cherish this unique place and the fact that we live and learn together on the traditional lands of the Scia’new First Nation – also known as the Beecher Bay First Nation or, as Chief Chipps has pointed out, Spirit Bay. Pearson is very special place, and I am committed to preserving its uniqueness while building on the great legacy of more than 42 years of which I am now the custodian. I am so privileged to have the opportunity to lead the College. As many of you know, the past months since the death of our baby daughter, Catherine, have been a devastating time for our family. I cannot ever adequately express my – and our – gratitude for the understanding, compassion and support of the Board, faculty, staff, and many other members of the Pearson community as my family and I coped (and continue to cope) with our tragedy. So many people stepped in and stepped up to ensure that life at Pearson continued on an even keel and without disruption for the students. I particularly want to single out Mark Bannar-Martin for his steady and reassuring leadership as acting Head of College in addition to his role as Dean of Studies. I know that you all join me in thanking Mark and in wishing him a wonderful experience as he embarks on his deferred and well-earned professional development leave. Among his many contributions, he shepherded the College through a very extensive and intensive accreditation process that began even before I came to Pearson. Mark along with Heather Gross worked diligently, along with many of you, to ensure the College put its best foot forward. I am thrilled to report that those efforts paid off: last week, the Council of International Schools informed us that Pearson College has “decided to award accreditation to Pearson College with immediate effect”. The implications of this decision are far-reaching. For the first time in our history Pearson College will be officially recognized by the BC Ministry of Advanced Education, and this in turn will facilitate the processing of student visas with the federal government. Congratulations and heartfelt thanks to the many people across the campus who shepherded the accreditation process and ensured that our College met every test of the stringent evaluation against internationally-agreed standards. In the coming months, there will be a special ceremony marking our accreditation and honoring the College team – led by Mark and Heather – who worked so hard and for so long to make this reality. I also want to take this opportunity to recognize both Dan Hurley and Ty Pile who have demonstrated exceptional leadership and nimbleness in dealing with all of the non-academic – and often unexpected – demands of their respective positions. I thank them for their unflagging and unflinching devotion to their varied roles and responsibilities, and especially for their persistence in moving ahead with the all-important Strategic Plan that was developed over the early months of 2016 in consultation with input from the entire community, including students, staff, faculty and alumni. Please stay tuned as we’ll have more to say about the strategic plan in the coming weeks and months. Along with Ty and Dan, I also recruited Valerie Colas last year. When I unexpectedly took extended leave last summer into the fall, this meant all three assumed their roles and responsibilities in my absence. By all counts, Valerie has already made herself an indispensable member of the Pearson Community – this is no surprise: I worked with Valerie for several years in Montreal at the Jeanne Sauve Foundation, which I headed prior to coming to Pearson, and I can say without a doubt that Valerie is a miracle worker! I may not have been physically present during the last few months, but I assure you that I have been aware of much of what you have done – at least all that can be followed via email and regular check-ins with the team here. Now I am back, with my sleeves rolled up and ready to continue in the spirit of relentless “Refresh and Renew.” And for this I will need your help. 1. To enhance Pearson’s public profile and engagement. 2. To ensure the College is on a sustainable financial footing. 3. To ensure Pearson’s program—both academic and experiential—is world-class and cutting-edge. With the engagement of Vice President Advancement and External Relations, Dan Hurley and his team, there has been a complete review and refreshing of Pearson’s public profile and engagement programs. There are exciting plans to meet the challenges of the increasingly crowded field of organizations and programs working to educate and engage the next generation of leaders and change agents. We know that we must consistently present Pearson as the unique entity that it is. Our increasingly fragmented world needs more Pearson Colleges – and more UWCs committed to our mission, and that of the UWC movement more broadly – let’s say it together: to make education a force to unite people, nations and cultures for a peaceful and sustainable future. You don’t need to be told, but the world must be reminded, that we do so by combining experiential learning with academic excellence; by educating and nurturing the whole person – mind, body and spirit. And we do all of this in order to prepare our students to tackle the problems of the world. We must build greater support by creating awareness of the important work we are doing, by telling our story – by sharing your stories and the stories of our 4,000 Alumni. We will spread our message right across the country and around the world. We will do this through public events, speeches, interviews and op-eds. We will spread the word through social media including our upcoming refreshed website which will share our stories with the world in a more visual and user-friendly way. In all of this, I see my central role as that of Chief Champion for Pearson College and, thus, as YOUR Chief Champion. This is a collective challenge for our leadership, involving both Advancement and Operations/Administration areas working in close cooperation with our Board, distinguished Alumni, donors, benefactors, granting agencies and many more. 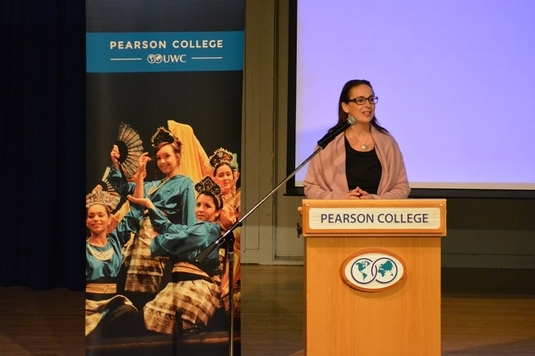 We were all delighted and proud that Pearson College successfully earned the $1 million (USD) matching funds from the Davis-UWC IMPACT Challenge! We could not have accomplished this without the enthusiastic participation and generous support of so many members of the Pearson community. However, we need to continue to work hard to secure long-term funding so that we can remain a school that attracts, nurtures and “unleashes” new generations of leaders and change makers who will create impacts in their communities and organizations across the globe. I have every confidence that the team here at Pearson is up to that challenge! Sustainability also means that our facilities and infrastructure create an exceptional learning environment and are exemplary from an environmental standpoint. In this respect, I point with pride to the extensive renovation of House #2, or as most of you know it, Japan House, that is now underway in anticipation of our return to a total enrolment of 200 students annually. This was my first major announcement as President in fall 2015 – and the facilities work needed to make this a reality is being carried out under Ty’s meticulous supervision. These are the goals on which the Strategic Plan was built and I am happy to report that we have been quietly and steadily advancing on all fronts. 3. Our central priority: To ensure Pearson’s program—both academic and experiential—is world-class and cutting-edge. With news of the CIS accreditation, we received some fresh evidence of just that! International accreditation demonstrates a school’s commitment to high quality global education to the College community and to the outside world. This means prospective students, their families, educational leaders and teachers as well as universities, embassies, governmental and private organizations, and both private and foundation-based supporters of independent schools like Pearson will be further assured that this College is world-class in the best sense of those words. While work on development and expansion of programs and material has continued unabated, the arrival of a new Vice President/Education will signal the start of a major review and refreshed approach to our academic and experiential education offerings. The search for the new VP has been intense and rigorous – 84 qualified applicants from 24 countries have been narrowed down to two. The finalists will be present on campus, over the next few days, sharing the Pearson experience, giving classes, meeting with faculty and staff and generally showing us how they would approach the job. I’m pleased to say that one of those candidates is with us this afternoon. Continued emphasis on actions that respond to the challenge issued by the Truth and Reconciliation Commission. As I have stated elsewhere, I believe that we at Pearson have a special responsibility – because we have the ability and the strong desire to respond to this challenge. The history and reality of Indigenous residential schools in Canada run counter to everything we at Pearson stand for. And, as a residential school that celebrates community and diversity in all its forms, we have a special opportunity to make a difference. Among the important steps taken was the appointment of Clint Kuzio as Indigenous Educator, Advisor & Coordinator of Reconciliation. He is leading classes in cultural awareness and safety and is helping develop a unique IB Anthropology course focusing on Indigenous Issues and Reconciliation in a global context. Learning can only take place in an environment that provides mental health support as well as a nurturing — and challenging – educational environment. I’ve talked in the past about our collective commitment to provide a more comprehensive and supportive structure for the mental health and wellness of all students and, in fact, all members of our Pearson community. Many of you are aware that every adult on campus took part – enthusiastically, I might add – in several days worth of health, wellness and safety training last August. This is not a one-time effort – this is a long-term annual commitment that is essential for a modern independent school that demands much of its students and adults. You may remember that, as part of the refreshed mandate to lead Pearson, we asked an independent and impartial expert on human rights to evaluate how well we are doing in supporting the health, safety and wellness of our community. I can tell you we’re doing well, but I can also tell you that this is also a long-term investment – it’s a review process that is still underway and is designed to helps us to understand better where we are effective and where we should continue to make improvements. I think we are cutting edge in every positive sense of the phrase! I’ve talked about our approach to reconciliation with Indigenous communities, our commitment to supporting the needs of the whole student and the steps we are taking to sustainability – in both environmental and financial senses – rebuild our facilities on campus without compromising the “wilderness” side of our nature. But, I’m particularly proud that we at Pearson – though we may already be leaders in our commitment to experiential education – are not resting on our laurels. Last year, you might remember, I asked a dear friend of this institution and the UWC, international educator and lawyerJohannah Bernstein to explore how we could deepen experiential education in both our curricular and co-curricular programs. During a 10-week on-campus immersion in all things Pearson, Johannah conducted in-depth interviews with Heads and educators at other UWCs as well as with leading organizations in education around the world. The outcome of this is an interactive guide for Pearson (and other UWC and IB schools around the world) to deepen experiential education within both the IB curriculum and the components that characterize the UWC educational model. This was presented at the 2016 UWC Congress in Trieste, Italy – and will be presented here on campus in the coming weeks. I am so proud of what has been accomplished since many of us were last together at the May 2016 Village Gathering! During my time away from campus I have followed you closely and been inspired by the information you shared about the extraordinary events and individuals that make this school absolutely unique. Among the many examples of hard work and dedication I’ve seen over the past several months, I want to congratulate the student organizers of last Saturday’s second iteration of a youth-focused TEDx event on campus. “We and the World” was a heart-warming success. I felt privileged to witness such a professionalstudent-initiated and -led event and I congratulate the organizers and presenters from both Pearson and the wider community, who so articulately and movingly shared their remarkable stories. The inclusion of speakers from outside of our Pearson Community is so important to remind us that this school – located here on the traditional lands of Canada’s First Peoples – is an integral part of the neighbourhoods and communities of the southern part of Vancouver Island. Kudos to all! I also want to single out the organizers of the Global Affairs events over the past several months. What a stellar group of speakers you have attracted! I know there is more of that to come! We have so much to look forward to in the coming months – the jewel in the crown is of course One World – dress rehearsal is exactly two months from today. Tickets are already on sale. One World will see some enhancements this year, we wish to showcase all student activities alongside the beloved and acclaimed performing arts talents of our students. I can’t wait! Very soon, we will unveil plans to mark the 150th anniversary of Canadian Confederation, and also the 60th anniversary of the award of the Nobel Peace Prize to our namesake Lester B. Pearson. This year also marks the 120th anniversary of Mr. Pearson’s birth. When I look back at my first Pearson experience, as a 16-year old member of SAGE (Solidarité Anti-Guerre Etudiante) promoting international peace and nuclear disarmament during the Cold War, I am again reminded that it wasn’t until we came to Pearson College at the tail end of our nine-month cross-country tour that we felt a true sense of solidarity with our peers. The Pearson students then were informed, intelligent, engaged, empowered – deeply committed to working for change and creating a better, more just and peaceful world. Today, you are a different generation, yes, but with the same aspirations and abilities. And there is no better way to build the bonds that you will need to go the hard, long distance required to create lasting change than to have a deliberately diverse and dynamic group of young people live, learn and lead together. I could not have imagined then that today I would have the honor of leading this wonderful institution. But the path I took since the SAGE Tour – as a student organizer, a global “youth ambassador”, a graduate researcher, a UN reporter, a political advisor, an advocate and, above all, as an educator, seems to have led inevitably back to where it all started – right here on Pedder Bay. I have devoted my life to engaging and empowering a new generation of leaders to tackle global problems. Now, I am here, above all, because I believe in you. I believe in your potential and your power to change the world. We have so much to look forward to in the coming months – the jewel in the crown is of course One World– dress rehearsal is exactly two months from today. Tickets are already on sale. Very soon, we will unveil plans to mark the 150thanniversary of Canadian Confederation, and also the 60th anniversary of the award of the Nobel Peace Prize to our namesake Lester B. Pearson. This year also marks the 120th anniversary of Mr. Pearson’s birth.